The grades are in. 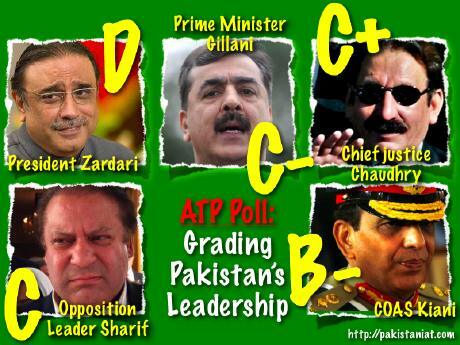 The current crop of Pakistani leaders get between a D and a B- for performance in current office. ATP readers are obviously tough graders. 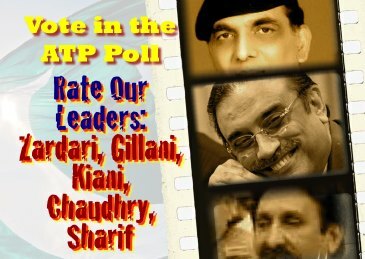 According our latest ATP Poll, and with over 800 votes cast, Asif Ali Zardari’s performance as President of Pakistan gets a grade of D; Yousuf Raza Gillani as Prime Minister does only slightly better with a C-, Iftikhar Chaudhry’s performance as Chief Justice of the Supreme Court gets a C+, Gen. Pervaiz Ashfaq Kiani gets a B- as Chief of Army Staff, and Nawaz Sharif as opposition leader gets a C (original poll here). We used the standard 4-point scale to convert the votes into a letter grade (A=4.0, B=3.0, C=2.0, D=1.0, F=0.0). 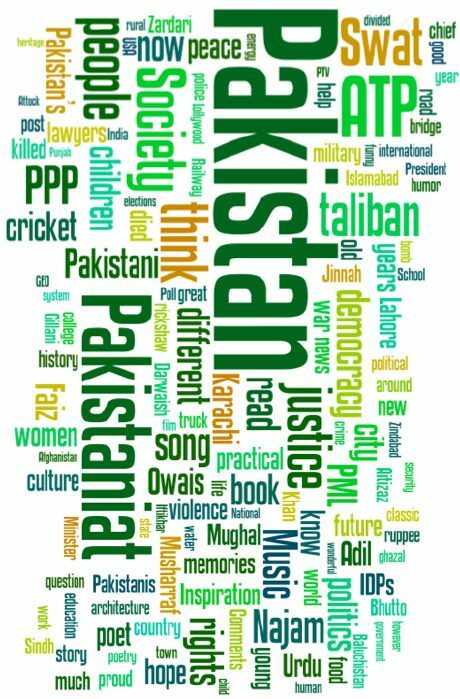 With nearly a quarter of all votes cast (and over half in the case of President Zardari’s assessment) being Fs it was mathematically not possible for anyone to get too high a grade, although 30% thought Gen. Kiani deserved an A and 26% thought the same for Iftikhar Chaudhry. 12% and 13%, respectively, thought that Yousuf Raza Gillani and Nawaz Sharif deserved an A, while 7% gave an A to President Asif Ali Zardari. As we had made clear in the poll question, this was not a popularity poll. It was a performance poll. Not surprisingly, the strongest feelings were reserved for President Asif Zardari (Grade=D; GPA=0.97). A majority of voters gave him a failing grade, although some commenters defended his performance as being much better than most had expected. Prime Minister Yousuf Raza Gillani got a grade just under the ‘average’ mark (Grade=C-; GPA=1.67), and commenters seems to suggest as much for his performance. Interestingly, he seems to command relatively greater respect amongst ATP readers than Mr. Zardari. A number of readers made clear that they were giving a good grade to Gen. Pervez Ashfaq Kiani (Grade=B-; GPA=2.68) because he has not dabbled in politics and for the operation against the Taliban. It is important, therefore, not to construe his relatively better grade as a desire for the military to take control; in fact, it seems (at least from the comments) to be quite the opposite). We had include Nawaz Sharif in the poll because in any democracy the opposition plays a very important role and that is what we had asked people to guage: his performance as an opposition leader. Our readers graded this performance to be average (Grade=C; GPA=1.91). Unscientific as a blog poll has to be, what do you think of the results? Is this the type of grade you woudl have expected for each of them? Why or why not? And irrespective of the grades, do you think their performance in their current jobs has been better or worse than you had expected them to perform? Do let us know. these people are not worth your attention… lest your rateing them ..they are the worst flock this country has ever seen …. if you want to call them leaders that is your call…not mine or any fairminded Pakistani’s. Very good poll. Excellent question and made me rethink how I evaluate these men. I think the grades are also fair. The best thing happening today is that the military is not interfering. If Zardari can finish his tenure without military achievement that would itself make him much more successful than everyone before him.